With the spread of social media on the web came increased sharing of websites and stories among friends. The popularity of Twitter has only increased the amount of interweb sharing that’s taking place. However, with the advent of Twitter came an idea that was not a part of more traditional social media – the 140 character limit. So What Problems Does the 140 Character Limit Pose? The 140 character limit hinders the process of effective sharing on Twitter due to the fact that if a URL is shorter than 140 characters, you aren’t left any room to add comments or info about the link you’re posting. And even then there’s still the URLs all over the web that exceed the limit on their own. A short URL is a process by which you make a link available on the internet via a short link which enables, among other the things, the ability to share on Twitter and still add value to the link by commenting about it. The problem arises when someone misleads you by masking the true identity of the destination URL by using a shortened URL and directing users to destinations with malicious intent. Don’t be too scared. There are ways to protect yourself depending on the browser you use or even 3rd party Twitter applications. Interclue is a Firefox add-on which once installed allows you to float your mouse over a link and click a bubble for more information about the destination of the short URL. 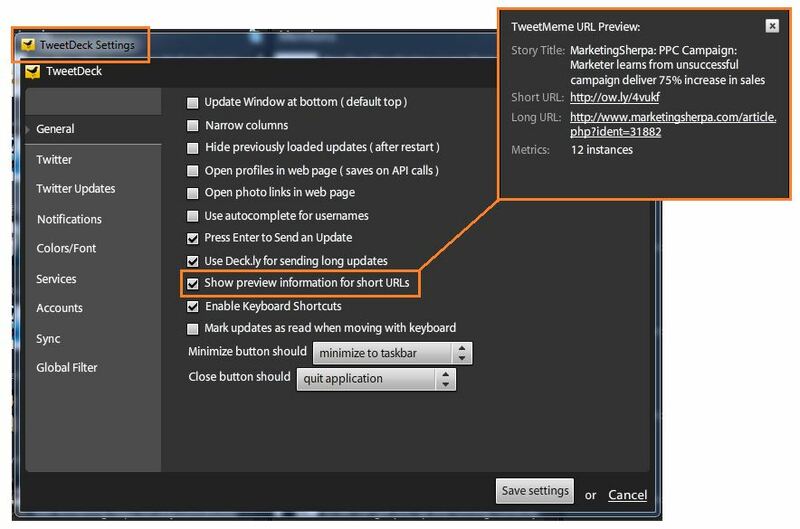 Another option would be to choose the correct 3rd party application, such as TweetDeck. TweetDeck allows users to enable the option to see more information about a short URL by clicking on the actual URL in the Tweet. A pop-up allows you to see more information about the link and then decide if you want to follow it. If you’re not into installing an add-on for your browser or using a 3rd party application, you can always do things the old-fashioned way and copy & paste the short URL into the tool at LongURL. Voila – more information. It’s as simple as that. Don’t be afraid of the short URL – embrace it, but make sure you’re protecting yourself. What are your favorite tools for deciphering short URLs? Generally putting SM icons in the upper right is the most widely accepted practice. The fallback should be in the footer if your design can’t handle the header. Always aim for header or footer as it’s become the “natural” place for people to look for them. It also depends on how highly you value a “follower” or a “like”. If gaining these are your main focus, you would not want to put your social media icons at the bottom of a 10 page scrolling blog. The flip side of this is that you risk the chance of taking someone off your site to your social media profile before passing through your content and being a potential customer/conversion. Branding them (changing the colors/textures) to your site can be beneficial, overdoing it can also be detrimental and hide/blend them into your site too much. Tagging articles, services or products with the ability to share through social media(facebook, twitter and linkedin) is a good way to gain followers and more exposure. When using Social Media Icon’s as links to your Social Media profiles make sure they open as a new window. You can use pre-made social media icon sets(basically just a set of image files, usually png’s in which you add and link manually, ex. ): http://webdesignledger.com/freebies/the-best-social-media-icons-all-in-one-place, http://visionwidget.com/toolz/4-design/416-free-social-media-icons.html. Facebook, Twitter and LinkedIn allow you to generate their code for interactive “like”, “follow” and “recommend” buttons. 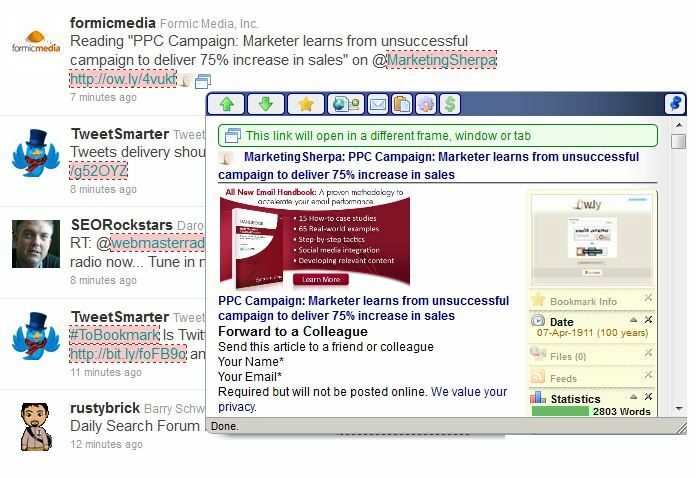 It can be worth utm tracking clicks on your sites Social Media Icons to see where visitors are falling off. Ie: are you getting 500 people clicking through to your Facebook pages, and only 20 people “liking” it. In this case this could be worth looking into your FB page itself. The flip side of that could be you are getting more “likes” then clicks, in which you most likely have bad placement of your SM icons on your website and they are finding your SM profiles through other means. http://www.huffingtonpost.com/ has incorporated their social media icons and a “like” button into their main navigation, which basically tells us that they value those activities highly. http://www.smashingmagazine.com/ makes their SM very prominent in the upper right, but separate it from their content, almost as though it’s on an island. http://www.foxnews.com/ puts their SM icons in the right side of their footer with very little prominence. This placement is very common as it is a widget area for a lot of CMS’. It seems a trend for News organizations to bury their SM icons. CNN does put a Facebook feed on the right side of all their pages so you can repost articles quickly. The days where everyone using Google sees the same 10 search results for a particular keyword have slowly passed us by. Google has managed to integrate video, image, and product information in the search engine results page (SERP) over the past few years. Local search results through Google Places and products like Google Boost have had a huge influence for our clients. And in 2009, Google introduced Social Search to the world. If you were logged in to your Google account and scrolled down to the bottom of the SERP, you would see how your social connections related to that search query, whether it be a shared link or blog post of theirs. Well just this morning Google announced they are pushing the search results envelope even further. Now, social search results will be mixed in the main organic section based on relevance. These social results don’t just appear when you friend on Twitter coincidentally shared the same article that’s in the #1 spot. According to Google’s Product Management Director of Search Mike Cassidy, these social connections may actually influence the rankings you see in Google. The other major difference was that with the old version of Social Search, you only saw results from your social network only when they created or shared something through their Google profile. Now Google can match up information from your friends on Twitter, Flickr, Quora and potentially even more in the future. This creates an even greater potentially for each and every Google user to have their own unique SERP. Facebook is the one major platform that is not included in this announcement and Cassidy was a little more vague on. However, Facebook is Bing’s territory and search results there can be influenced by your Facebook friends. So where does this leave small business and site owners? We’ve always believed that social networks like Twitter and Facebook can be valuable tools when you listen to your audience and create genuine relationships, not spammy sales pitches every hour. Providing valuable content and interactions with your audience now have the greater potential to affect their search results. Plus, it sounds like Google has algorithms for these search results to weed out overtly spam content too. The news today reminds us that you shouldn’t obsess over being #1 for all your relevant keywords, as we all now know everyone’s search results can be drastically different. Instead, try to focus on your bottom line – driving qualified traffic that will interact with your site and convert well. Do you like what Google is doing with Social Search? Tell us your thoughts below. Location is everything. So it comes as no surprise that one of the fastest climbing social media sites on the web is adding a location feature to their social toolset. Twitter has just announced that their new location API will soon be rolled out to users to couple location data with individual tweets for a more robust set of information. Imagine you are road tripping to Portland to visit a friend and make a Quiznos pit-stop. As a Twitter user they will be able to tell that you are at the Quiznos in Hood River and will arrive on their doorstep in under an hour. This combination will in theory make each tweet more meaningful (as content and users will be searchable by actual location), relevant and develop into a more powerful business, marketing and personal tool with this additional layer of data. Not long from now, knowing someone’s precise location in real-time will be a huge part of how Twitter is turning the corner towards new and data-driven innovations – even before Facebook has had the chance to add a similar location-based element to their site. Being able to accurately “TwitterStalk” an individual by location may raise speculation, but perhaps this “I know Where You Tweeted from Last” addition will be able to bring relevancy to even the most useless of tweets by placing them in context by location. Thus, making the Twitter experience more impactful for more users. And on another note, the opt-in aspect of this location feature should help to avoid the indignation of even their most privacy-paranoid users. Your location will only be shared if you check the box. So how will this change help us and help Twitter users worldwide? People will be able to more accurately search for the information they are looking for. Tweets can be filtered efficiently by location, making you an even more informed stalker. There is the potential to build and launch a location-based ad network – which I know we’ve all been waiting to see when Twitter would take a stab at this. We, as social media users and consumers, are much more adapted to the constant changes that happen daily within the social media landscape than we were just 3 years ago. In the fall of 2006, I can recall the racket that ensued around my college campus when Facebook added their first generation “Mini-Feed”, and which quickly inspired an outburst of “groups against the Facebook Mini-Feed” in heated protest. This whole new level of knowledge of what friends were doing on Facebook was mind boggling. Now several years down the road, the idea that we can see the actual location that someone is posting from is exciting and highly anticipated by many users. Getting news and information from friends and connections in real-time is the norm, and waiting to read headlines as they roll off the press seems archaic. With the rise of Twitter and the mass of second-by-second information sharing, the need and expectation that this would be taken to the next level was imminent. Location information is the next big thing, and the big online powerhouses like Google have already begun their work on it. Google was on the ball first, launching Google Latitude. The smart players like Twitter have to adapt, re-tool and innovate to not only keep up, but to continue to evolve the way we use social media. Facebook. Twitter. MySpace. Today is the “golden age,” the renaissance, the awakening, of social media sites. From Facebook to Twitter, not only is the user population exploding, but businesses of all sizes from the “David” (small) to the “Goliath” (large) are seizing the opportunity to reel in the masses and promote themselves. One of the largest social media sites on the scene, Facebook, currently has over 250 million active users, with 120 million of them logging on at least once per day. These numbers are gargantuan compared to the early 2000’s, or the “dark ages” when I myself joined the elite Facebook clique. A select few of my former high school buddies had the special privilege to be part of this newfound type of social media. Since then the small town group has expanded into an extremely large community where now thousands of my tiny Texas high school comrades are members. It is only coincidental that the fast growing demographic of new Facebook users is the over 35 crowd. And that is just one example on how the dark ages of social media experienced an awakening of sorts and transformed itself from one little weed in your lawn, to your lawn being all weeds. Looking back 1 to 2 years, I didn’t even know what a “tweet” was. Fast forward to today and Twitter is the new rage of social media, and businesses from small to large, are spreading their wings on Twitter by storm. Why you might ask? 752% is why. That is the amount of growth that Twitter has experienced in the last year. Twitter allows a business to not only communicate effectively with its customer base through tweets, but also allows sales, specials, and promotions to be advertised. Think of it as the free version of non-traditional advertising. Particularly the struggling airlines (lower your fares!) and local businesses have established their little places of happiness on Twitter, targeting leisure travelers and the local foodie crowd. Communicating with your constituency is an advantage that conglomerates on Twitter have. Particularly, both United Airlines and Alaska Airlines frequently advertise fare specials and communicate with their fliers through Twitter. United has “TWARES,” fares available only to their 18,000 loyal followers, most recently advertising a cheap fare between the Gateway City and the lovely Windy City. Alaska Airlines most recently advertised a fare sale between Portland and Southern Alaska, which I wish was still going on, as the heat is unbearable in Portland this week. Keep your reputation and feelings towards your business above the clouds by communicating directly with your customer base, which in this day and economy is more important than just selling products. Local businesses in Portland have carved their space onto Twitter as well. Burgerville, a restaurant chain in Washington and Oregon, that has the best onion rings ever, recently used Twitter to promote its new mobile cart the “Nomad.” The location of the “Nomad” was publicized via Twitter to the masses, generating large interest in the Burgerville brand. Fortunately the “Nomad” parked itself only a few blocks away from our local Formic offices here in Portland. We all enjoyed fries, burgers, and Oregon raspberry lemonade, which are not usually readily available for our lunchtime cravings. What’s the moral of the story? The answer is that any business, from a small mom and pop shop to a multi-billion dollar worldwide corporation, can benefit from the use of social media sites. Use it to reach out to your local consumer base to advertise specials for free without selling your soul to traditional forms of print and television advertising. Make yourself known! Crush your competitors (not literally) and take the upper hand in these tough economic times by reaching out to your constituents! If you’re interested in cost effective online marketing and overtaking your competitors by setting up a social media campaign, our team has a plan for you. One of the largest social media sites on the scene, Facebook, currently has over 250 million active users, with 120 million of them logging on at least once per day. These numbers are gargantuan compared to the early 2000’s, or the “dark ages” when I myself joined the elite Facebook clique. A select few of my former high school buddies had the special privilege to be part of this newfound type of social media. Since then the small town group has expanded into a extremely large community where now thousands of my tiny Texas high school comrades are members. It is only coincidental that the fast growing demographic of new Facebook users is the over 35 crowd. And that is just one example on how the dark ages of social media experienced an awakening of sorts and transformed itself from one little weed in your lawn, to your lawn being all weeds. Looking back 1 to 2 years, and I didn’t even know what a “tweet” was. Fast forward to today and Twitter is the new rage of social media, and businesses from small to large, are spreading their wings on Twitter by storm. Why you might ask? 752% is why. That is the amount of growth that Twitter has experienced in the last year. Twitter allows a business to not only communicate effectively with its customer base through tweets, but also allows sales, specials and promotions to be advertised. Think of it as the free version of non-traditional advertising. Particularly the struggling airlines (lower your fares!) and local businesses have established their little places of happiness on Twitter, targeting leisure travelers and the local foodie crowd. Communicating with your constituency is an advantage that conglomerates on Twitter have. You’re your reputation and feelings above the clouds by communicating directly with your customer base, which in this day and economy is more important than just selling products. Particularly, both United Airlines and Alaska Airlines frequently advertise fare specials and communicate with their fliers through Twitter. United has “TWARES,” fares available only to their 18,000 loyal followers, most recently advertising a cheap fare between the Gateway City and the lovely Windy City. Alaska Airlines most recently advertised a fare sale between Portland and Southern Alaska, which I wish was still going on, as the heat is unbearable in Portland this week. Local businesses in Portland have carved their space onto Twitter as well. Burgerville, a restaurant chain in Washington and Oregon, that has the best onion rings ever, recently used Twitter to promote its new mobile cart the “Nomad.” The location of the “Nomad” was publicized via Twitter to the masses not generating large interest in the Burgerville brand. Fortunately the “Nomad” parked itself only a few blocks away from our local Formic offices here in Portland. We all enjoyed fries, burgers, and Oregon raspberry lemonade, which are not usually readily available for our lunchtime cravings. What’s the moral of the story? The answer is that any business, from a small mom and pop shop to a multi-billion dollar worldwide corporation can benefit from the use of social media sites. Use it to reach out to your local consumer base to advertise specials for free without selling your soul to traditional forms of print and television advertising. Make yourself known! Crush your competitors (not literally) and take the upper hand in these tough economic times by reaching out to your constituents! YouTube: The good, the bad and the ugly. Or, the power of social media. Last week was an interesting week in the internet world. It was definitely a combination of the good, the bad and the ugly on how the power of social media can affect a brand, push a cause or create an insta-celebrity. The Ugly. CNN and Ashton Kutcher Twitter wars. From ugly to eventually good, the race was on for 1 million twitter followers. Kutcher promised to donate 10,000 mosquito bed nets to charity for World Malaria Day in late April if he bested CNN, and 1,000 if he lost. The cable news network agreed to do the same. Then Larry King posted his own video response, as noted by this CNN article on Ashton Kutcher. In the following news storm, it’s been written that Ashton Kutcher was the first to leverage Twitter and social media as a whole for the benefits of social change. Do you agree? What still remains ugly, Oprah started her twitter account… Now that Oprah is twittering, is this death for Twitter? In our last few blog postings Formic has talked about social media. What is it, how can you use it effectively and how can you tie it into your overall marketing strategy? Hopefully we have answered a few of those over arching questions for you, but we would like to take it a step further and talk about a few of our favorite social media hot spots. Today, let’s talk about Twitter. You have heard the talk, but not quite sure what it is. What’s a tweet? Why should I tweet. How can it keep me in touch with my customers? What are the rules of good, effective tweeting? 1. Learn about Twitter. Get an account, lurk for a while and get a feel of the environment. See what other small businesses (or larger) are tweeting about. Follow some people that you know in your industry, market or perhaps something that you do outside of “work”. See who your followers and those you follow are following – then follow all those that apply to your business goals and objectives. I tend to be a news junkie, and most of my favorite reporters and journalists are online with Twitter accounts. I started following them and seeing how they tweet and respond to other tweets. And to be honest, I asked my 17 year old and her friends what it was all about. Don’t have a teenager? I’ll loan you mine for a small fee. 2. Decide why you want to Twitter? Have a strategy in place. Travis Campbell of Small Business Internet Solutions.com has come up with some great rules of the road for a small business to hop on the Twitter on-ramp http://smallbizinternetsolutions.com/rules-of-using-twitter-for-business/ . Having a simple strategy or goal in place as to what and why you want to twitter for your business is a great place to start. Twittering just for twitter’s sake can ruin your brand. 3. How can Twitter keep me in touch with my customers? The blogosphere, ecommerce and the internet in general is a pretty impersonal place to be. Tweeting unique, newsworthy and special things about you and your business keeps your customers interested. You can interact and find out what they are thinking. How is this important? We all know the cable giant Comcast and how badly perceived their customer service has been blogged, reported, listed and the like. Comcast chose to fight the perceptions online using the same resources that their customers were using on the internet. Comcast responds to customer complaints via Twitter, Facebook and other social media outlets. They have done a pretty good job turning around a pretty bad perception of poor customer service, while reworking their brand by using customer interaction. 4. Be a good tweeter: Be careful not to over tweet or people will start to get annoyed and tune your messages out, and certainly watch what you are tweeting. See rule number two – stick to your strategy and goals.